Name Variation Geraldine M. Bauer was also known as Gerri. Married Name 8 August 1964 As of 8 August 1964,her married name was Bergman. Geraldine M. Bauer was born on 24 January 1945. She was the daughter of Joseph Anthony Bauer and Marian Laubmeier. Geraldine M. Bauer died on 30 October 2008 at age 63 Geraldine M. Bergman, age 63 of Plain, passed away on Thursday, Oct. 30, 2008, at her residence following an illness. She was born on Jan. 24, 1945, in Franklin Township, the daughter of Joseph and Marian (Laubmeier) Bauer. She was married to William Bergman on Aug. 8, 1964. Geraldine was a member of St. Luke's Catholic Church, the Catholic Order of Foresters and the National Council of Catholic Women and worked 33 years at the Palace Bar and Bowl in Plain. Survivors include her husband, William Bergman of Plain; three children, George (Jean) Bergman of Plain, Tim (Suzette) Bergman of Stoughton and Jessica (Dan) Pape of Spring Green; eight grandchildren, Olivia, Austin and Will Bergman all of Plain, Victoria, Brianna and Sierra Bergman all of Stoughton, and Luke and Sam Pape both of Spring Green; five sisters, Donna Gruber and Marlene Gruber both of Spring Green, Evelyn (Gerald) Watson of Dodgeville, Betty Ann (Harlan) Meister of Chatham, Ill. and Delores (Gene) Neuheisel of Spring Green; a brother-in-law, LaVerne Haas of Plain; and nieces, nephews, other relatives and friends. She was preceded in death by her parents, Joseph and Marian Bauer; three sisters, Mary and Josephine Bauer and Luella Haas; and two brothers-in-law, Ray and Tony Gruber. A Mass in Memory of Geraldine will be held on Sunday, Nov. 2, 2008, at 3 p.m. at ST. LUKE'S CATHOLIC CHURCH in Plain. Father Mike Resop will officiate with burial in the church cemetery at a later date. Visitation will be held on Sunday at the church from 12:30 p.m. until the time of Mass at 3 p.m. The Richardson-Stafford Funeral Home is assisting the family with the arrangements. Geraldine M. Bauer obtained US Social Security Card at Wisconsin; last residence Plain, Sauk, Wisconsin. Martin Meister Jr. was born in May 1867 at Germany also reported as May 1869. He was the son of Martin Meister Sr. and Walburga Zimmerman. Martin Meister Jr. married Theresia Anna Kraemer, daughter of Paul Kraemer and Walburga Stangel, on 20 November 1892. Martin Meister Jr. died on 3 March 1955 at Baraboo, Sauk, Wisconsin, at age 87 Martin Meister Sr Dies in Baraboo, Rites Held Saturday - Funeral services were held Saturday morning at Sacred Heart Catholic Church in Reedsburg for a former Plain farmer, Martin Meister, 87, who died Thursday morning at the St. Mary's Ringling Hospital in Baraboo. He had been living with a daughter at Lake Delton. Burial was in St. Luke's Cemetery at Plain. His wife and a son, George, preceded him in death. Martin Meister Jr. immigrated with Martin Meister Sr. and Walburga Zimmerman in 1883. [S244] U.S. Federal Census 1910 U.S. Federal Census, by Ancestry.com, Year: 1910; Census Place: Bear Creek, Sauk, Wisconsin; Roll: T624_1736; Page: 6B; Enumeration District: 0110; Image: 780; FHL Number: 1375749. [S243] U.S. Federal Census 1920 U.S. Federal Census, by Ancestry.com, Year: 1920;Census Place: Bear Creek, Sauk, Wisconsin; Roll: T625_2015; Page: 7A; Enumeration District: 160; Image: 20. [S250] U.S. Federal Census 1930 U.S. Federal Census, by Ancestry.com, Year: 1930; Census Place: Bear Creek, Sauk, Wisconsin; Roll: 2609; Page: 7B; Enumeration District: 8; Image: 44.0. Name Variation Theresia Anna Kraemer was also known as Theresa. Name Variation Theresia Anna Kraemer was also known as Kramer. Married Name 20 November 1892 As of 20 November 1892,her married name was Meister. Theresia Anna Kraemer was born on 1 March 1873 at Sauk, Wisconsin. Theresia Anna Kraemer married Martin Meister Jr., son of Martin Meister Sr. and Walburga Zimmerman, on 20 November 1892. Theresia Anna Kraemer died on 5 September 1928 at Madison, Dane, Wisconsin, at age 55 Theresia Anna (Kraemer) Meister was born in the town of Franklin March 1st, 1873, and passed away to her reward September 5, 1928, at St. Mary's hospital, aged 55 years, 6 months and 4 days. November 20th, 1892, she was united in holy matrimony to Martin Meister. To this union were born ten children, the youngest dying in infancy. Those besides her husband who mourn her loss are: John of Mineral Point, George of Prairie du Chien, Joe of ?, Martin of Keysville, Mrs. Celia Barnard of Spring Green, and Thresia Walsh of Loreto, Clara, Hilda and Albert at home; also eleven grandchildren, two sisters, Mrs. Joe M. Ruhland and Mrs. George Laubmeier (another sister, Mrs. Francis Weidner, preceded her in death six months ago) and three brothers, Peter, John and Joseph, all of Plain. The deceased has been a patient sufferer for some time and was taken to St. Mary's hospital, where all was done that earthly hands could do until our Lord called her Wednesday morning at eleven o'clock. A Solemn High Mass was sung by Father Surges, assisted by Father Fladd as deacon and Mr. Vincent Peters as subdeacon, after which her body was laid to rest in St. Luke's cemetery. Theresia Anna Kraemer had 3 with 3 living in 1900 children. She had 7 with 7 living in 1910 children. Children of Theresia Anna Kraemer and Martin Meister Jr.
John Meister was born on 3 October 1893 at Wisconsin. He was the son of Martin Meister Jr. and Theresia Anna Kraemer. John Meister died on 10 March 1976 at age 82. George Meister married Mary Neusbaum. George Meister was born on 14 March 1896 at Wisconsin. George Meister died in 1935. Name Variation Celia Barbara Meister was also known as Cecelia. Celia Barbara Meister was born on 30 January 1903 at Wisconsin. She was the daughter of Martin Meister Jr. and Theresia Anna Kraemer. Celia Barbara Meister died in 1998. Married Name 18 December 1934 As of 18 December 1934,her married name was Krohn. Clara Meister was born circa 1909 at Wisconsin. Clara Meister married Erwin A. Krohn, son of Charles H. Krohn and Laura Krueger, on 18 December 1934. Clara Meister died on 5 January 1970. Martin Meister Sr. was born in September 1836 at Germany. He married Walburga Zimmerman circa 1867. Martin Meister Sr. died on 3 October 1919 at age 83. Martin Meister Sr. and Walburga Zimmerman immigrated in 1883. Married Name circa 1867 As of circa 1867,her married name was Meister. Walburga Zimmerman was born on 1 August 1834 at Germany also reported as 1833. She married Martin Meister Sr. circa 1867. Walburga Zimmerman died on 29 December 1904 at Sauk, Wisconsin, at age 70. Walburga Zimmerman and Martin Meister Sr. immigrated in 1883. Walburga Zimmerman had 5 with 4 living in 1900 children. Children of Walburga Zimmerman and Martin Meister Sr.
Married Name Her married name was Meister. Mary Neusbaum married George Meister, son of Martin Meister Jr. and Theresia Anna Kraemer. Albert Meister was born on 1 July 1913 at Wisconsin. Albert Meister died in January 1986 at Wisconsin at age 72. Name Variation Hilda Barbara Meister was also known as Hildagard. Hilda Barbara Meister was born on 19 December 1910 at Wisconsin. Hilda Barbara Meister died on 25 April 1989 at Sauk, Wisconsin, at age 78. Married Name 15 May 1923 As of 15 May 1923,her married name was Ring. Emma Theresa Blau was born on 7 October 1902 at Wisconsin. She was the daughter of John Blau and Caroline Gruber. 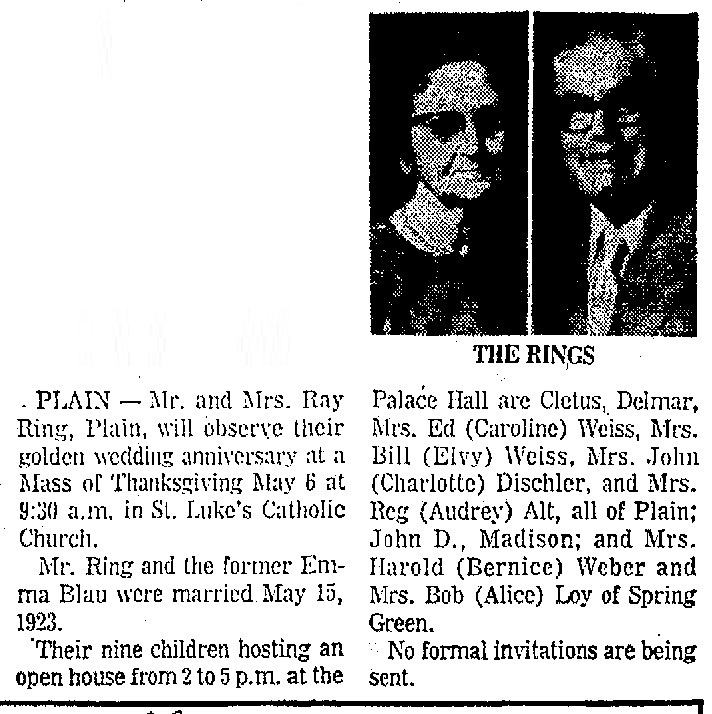 Emma Theresa Blau married Raymond Ring on 15 May 1923. Emma Theresa Blau died on 18 September 1993 at Sauk, Wisconsin, at age 90. 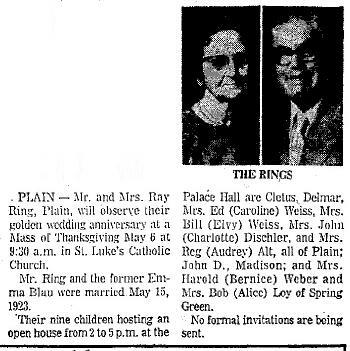 In April 1973 Ray and Emma (Blau) Ring 50th wedding anniversary article. [S244] U.S. Federal Census 1910 U.S. Federal Census, by Ancestry.com, Year: 1910; Census Place: Franklin, Sauk, Wisconsin; Roll: T624_1736; Page: 2B; Enumeration District: 0115; Image: 886; FHL Number: 1375749. Herman Michael Blau was born on 14 August 1904 at Wisconsin. He was the son of John Blau and Caroline Gruber. Herman Michael Blau married Lucy A. Schoenmann, daughter of William Fredrick Schoenmann and Katherine Paulus, in 1931. Herman Michael Blau died in January 1973 at Sauk, Wisconsin, at age 68. [S250] U.S. Federal Census 1930 U.S. Federal Census, by Ancestry.com, Year: 1930; Census Place: Plain, Sauk, Wisconsin; Roll: 2609; Page: 1A; Enumeration District: 26; Image: 276.0. Michael Simon Blau was born circa 1907 at Wisconsin. Louise Florence Blau was born circa 1909 at Wisconsin. Adeline Margaret Blau was born circa 1912 at Wisconsin. Name Variation Gertrude Pierick was also known as Catharine. Name Variation Gertrude Pierick was also known as Peirick. Married Name 7 February 1880 As of 7 February 1880,her married name was Nondorf. Married Name circa 1896 As of circa 1896,her married name was Albrecht. Gertrude Pierick was born in November 1863 at Germany. She married Anthony Nondorf on 7 February 1880 at Iowa, Wisconsin. Gertrude Pierick married Henry Albrecht circa 1896 at second marriage for her; first for him. Gertrude Pierick died after April 1910. Gertrude Pierick had 6 with 6 living in 1900 children. She had 9 with 7 living in 1910 children. [S246] U.S. Federal Census 1880 U.S. Federal Census, by Ancestry.com, Year: 1880; Census Place: Highland, Iowa, Wisconsin; Roll: 1429; Family History Film: 1255429; Page: 81C; Enumeration District: 152; . [S245] U.S. Federal Census 1900 U.S. Federal Census, by Ancestry.com, Year: 1900; Census Place: Highland, Iowa, Wisconsin; Roll: T623_1791; Page: 4A; Enumeration District: 62. [S244] U.S. Federal Census 1910 U.S. Federal Census, by Ancestry.com, Year: 1910; Census Place: Clyde, Iowa, Wisconsin; Roll: T624_1711; Page: 2A; Enumeration District: 0051; Image: 766; FHL Number: 1375724. Name Variation Anthony Nondorf was also known as Antone. Anthony Nondorf was born circa 1850 at Germany. He married Gertrude Pierick on 7 February 1880 at Iowa, Wisconsin. Anthony Nondorf died on 19 March 1895 at Iowa, Wisconsin. Henry Albrecht was born in September 1868 at Germany. He married Gertrude Pierick circa 1896 at second marriage for her; first for him. Henry Albrecht died after April 1910. Joseph Albrecht was born in June 1896 at Wisconsin. He was the son of Henry Albrecht and Gertrude Pierick. William Albrecht was born in November 1898 at Wisconsin. Hildegard Albrecht was born circa 1902 at Wisconsin. She was the daughter of Henry Albrecht and Gertrude Pierick. Christine M. Nondorf was born in March 1881 at Wisconsin. She was the daughter of Anthony Nondorf and Gertrude Pierick. Name Variation Catherine G. Nondorf was also known as Katie G.
Catherine G. Nondorf was born in December 1887 at Wisconsin. Name Variation Anthony Frank Nondorf was also known as Anton Frank. Name Variation Anthony Frank Nondorf was also known as Antony. Anthony Frank Nondorf was born on 6 December 1891 at Wisconsin. He was the son of Anthony Nondorf and Gertrude Pierick. Anthony Frank Nondorf married Anna M. Linscheid, daughter of Jacob Linscheid and Catherine Katherine Hying, circa 1918. Anthony Frank Nondorf died on 5 January 1979 at Iowa, Wisconsin, at age 87. Anthony Frank Nondorf obtained US Social Security Card at Wisconsin; last residence Highland, Iowa, Wisconsin. On 5 June 1917 at World War I Draft Registration, Iowa, Wisconsin. Patricia Weitzel was the daughter of Frederick M. Weitzel and Arvilla Nona Davis. Patricia Weitzel died before May 1994. Gifford Garld Davis was born on 17 May 1890 at Ithaca, Richland, Wisconsin. He was the son of John Henry Davis and Mary Edna Grover. Gifford Garld Davis married Alma Tracy Kissling, daughter of John Kissling and Clara Huebsch, on 16 February 1916. Gifford Garld Davis died on 26 December 1954 at Wisconsin at age 64. 1 June 1905 Ithaca, Richland, Wisconsin Gifford Garld Davis appeared on the census of 1 June 1905 in the household of John Henry Davis at Ithaca, Richland, Wisconsin. [S245] U.S. Federal Census 1900 U.S. Federal Census, by Ancestry.com, Year: 1900; Census Place: Ithaca, Richland, Wisconsin; Roll: T623_1813; Page: 9B; Enumeration District: 115. [S244] U.S. Federal Census 1910 U.S. Federal Census, by Ancestry.com, Year: 1910; Census Place: Ithaca, Richland, Wisconsin; Roll: T624_1732; Page: 1A; Enumeration District: 0094; Image: 983; FHL Number: 1375745. [S243] U.S. Federal Census 1920 U.S. Federal Census, by Ancestry.com, Year: 1920;Census Place: Ithaca, Richland, Wisconsin; Roll: T625_2013; Page: 4B; Enumeration District: 201; Image: 211. [S250] U.S. Federal Census 1930 U.S. Federal Census, by Ancestry.com, Year: 1930; Census Place: Ithaca, Richland, Wisconsin; Roll: 2608; Page: 2B; Enumeration District: 9; Image: 684.0. Married Name 16 February 1916 As of 16 February 1916,her married name was Davis. Alma Tracy Kissling was born on 31 January 1894 at Wisconsin. She was the daughter of John Kissling and Clara Huebsch. Alma Tracy Kissling married Gifford Garld Davis, son of John Henry Davis and Mary Edna Grover, on 16 February 1916. Alma Tracy Kissling died on 31 December 1918 at age 24. Ray Virgil Davis was born on 31 May 1886 at Richland, Wisconsin. Ray Virgil Davis married Nona E. Hampton circa 1913. Ray Virgil Davis died on 4 June 1942 at Richland, Wisconsin, at age 56 Ray Virgil Davis, 56, died at a Richland Center hospital Thursday after a five-year illness. He was born at Boaz May 31, 1886, and was married to Nona Hampton. He was a carpenter. Survivors include his wife; a son, Gerald, Richland Center; two daughters, Mrs. Berent Herred, Richland Center, and Mrs. Frederick Weitzel, Bear Valley; his father, John Davis, Ithaca, and a brother Gifford. 1 June 1905 Ithaca, Richland, Wisconsin Ray Virgil Davis appeared on the census of 1 June 1905 in the household of John Henry Davis at Ithaca, Richland, Wisconsin.